This week our main priority is Halloween planning because the holiday is just a few days away! However, we will also continue on with some additional Christmas planning and preparations, to keep things moving along for Christmas too. Can you believe we are already into week 4 of this series? That means that there are only 9 weeks left until Christmas! Time is sure flying by. I hope you are doing well with your preparations. I know this series is motivating me, and I have gotten more accomplished this year so far and have had some fun times with my kids already. From our previous weeks of this series you have already gotten or made Halloween costumes for your kids, decorated your home, set a menu for Halloween night, and considered your Halloween traditions. This week comes the really fun part -- preparing for and then actually celebrating this holiday. Task 1: Buy Your Halloween Candy And Other Supplies For Your Meal - Buy your candy for the trick or treaters, if you haven't already, and while at the store make sure to pick up anything else you need for your Halloween meal. I did not suggest this task earlier in the series, even though I generally like to get things done ahead of time, for the following reason -- I tend to eat the candy if I buy it early. So my philosophy on this one is to save it for the last minute and save a few calories too! 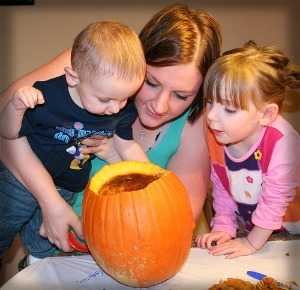 Task 2: Carve Your Pumpkins - You may have already done this one too. I know several people on my block have, but I have found that when we do it too early the pumpkins start to look rotted and caved in by Halloween night (although you can follow these tips for preserving carved pumpkins to lessen this problem). That is why we like to save it until the week of Halloween at our house. Task 3: Prepare For A Safe Halloween - Trick or treating, and dressing up in costumes, and all the other Halloween traditions can be a lot of fun for kids, but you need to be safe as you do it. Take a few minutes and review these Halloween safety tips for kids yourself, and with your kids, and take any actions necessary to make their night safer, so everyone can have a great time. Examples of things to do (but I urge you to read the whole article) include making sure you put some reflective tape on any kid's costume which is dark in color. In addition, you may want to get some glow sticks and fresh batteries for flash lights to make sure everyone can see well as they walk along the sidewalk as it gets dark, and that others can see your family too. Task 4: Enjoy Halloween Night With Your Family - You've done all the Halloween planning, so now it's time to reap the rewards of those incremental steps. Enjoy your Halloween night with the ones you love. Make sure to take lots of pictures, and maybe pop in a family Halloween movie after trick or treating as a fun way to unwind. 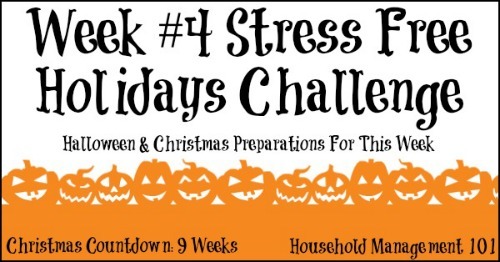 Normally we don't start Thanksgiving preparations as part of this Stress Free Holidays Challenge until after Halloween is over, but this year is a bit different because Thanksgiving comes early. 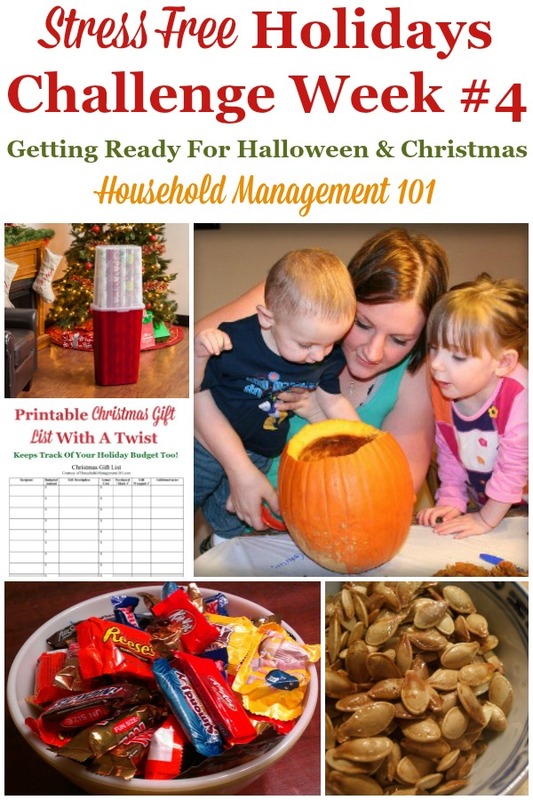 Therefore, if you want to get a jump start on preparations, perhaps after Halloween day is over, later this week, I wanted to give you some resources to get started. I'd start by grabbing a copy of the Thanksgiving planner pages here. 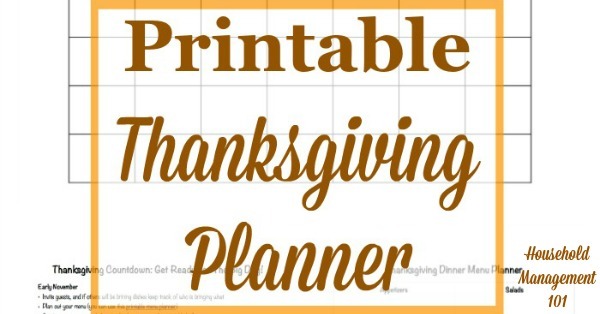 Then, I'd also read the Thanksgiving countdown plan here, which discusses some of the early preparations to do about a month out, which is about now, and do anything that you feel can't wait another week. We'll start preparing for Thanksgiving in earnest next week, so you'll have plenty of time, even with the shortened preparation time. I don't have too much that you need to do this week for Christmas planning, because this is actually the week of Halloween, so Halloween planning is the priority. 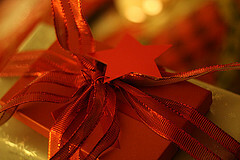 However, I have a task you won't finish this week, but should at least start -- gift buying and wrapping. Have you ever had a marathon wrapping session the night before Christmas, and stayed up way too late and been bleary eyed when the kids tore through all that paper just a few hours later? I know I have, and I didn't think it was much fun. My solution -- wrap as you go. When you buy a present go ahead and wrap it up, fasten on a secure label, and mark the Christmas gift list you have created to remind yourself that you bought or made the present, it is wrapped, and where you stored it. Also, if you are spacing out your purchases for budgeting reasons make sure to prioritize the ones that you will make, so you can go ahead and buy the supplies, and also the ones that need to be shipped. That way you have time to take those packages to the post office before the long lines begin to form, and so you can pay only regular shipping, not any extra rush charges too.